My previous post was awfully long, so I must assume many of my readers may have started to read it, but… Well… Gave up halfway or even sooner. 🙂 I added a footnote, though, which is interesting to reflect upon. Also, I know many of my readers aren’t interested in the math—even if they understand one cannot really appreciate quantum theory without the math. But… Yes. I may have left some readers behind. Let me, therefore, pick up the most interesting bit of all of the stories in my last posts in as easy a language as I can find. We have that weird 360/720° symmetry in quantum physics or—to be precise—we have it for elementary matter-particles (think of electrons, for example). In order to, hopefully, help you understand what it’s all about, I had to explain the often-confused but substantially different concepts of a reference frame and a representational base (or representation tout court). I won’t repeat that explanation, but think of the following. If we just rotate the reference frame over 360°, we’re just using the same reference frame and so we see the same thing: some object which we, vaguely, describe by some ei·θ function. Think of some spinning object. In its own reference frame, it will just spin around some center or, in ours, it will spin while moving along some axis in its own reference frame or, seen from ours, as moving in some direction while it’s spinning—as illustrated below. To be precise, I should say that we describe it by some Fourier sum of such functions. Now, if its spin direction is… Well… In the other direction, then we’ll describe it by by some e−i·θ function (again, you should read: a Fourier sum of such functions). Now, the weird thing is is the following: if we rotate the object itself, over the same 360°, we get a different object: our ei·θ and e−i·θ function (again: think of a Fourier sum, so that’s a wave packet, really) becomes a −e±i·θ thing. We get a minus sign in front of it. So what happened here? What’s the difference, really? Well… I don’t know. It’s very deep. Think of you and me as two electrons who are watching each other. If I do nothing, and you keep watching me while turning around me, for a full 360° (so that’s a rotation of your reference frame over 360°), then you’ll end up where you were when you started and, importantly, you’ll see the same thing: me. 🙂 I mean… You’ll see exactly the same thing: if I was an e+i·θ wave packet, I am still an an e+i·θ wave packet now. Or if I was an e−i·θ wave packet, then I am still an an e−i·θ wave packet now. Easy. Logical. Obvious, right? But so now we try something different: I turn around, over a full 360° turn, and you stay where you are and watch me while I am turning around. What happens? Classically, nothing should happen but… Well… This is the weird world of quantum mechanics: when I am back where I was—looking at you again, so to speak—then… Well… I am not quite the same any more. Or… Well… Perhaps I am but you see me differently. If I was e+i·θ wave packet, then I’ve become a −e+i·θ wave packet now. Not hugely different but… Well… That minus sign matters, right? Or If I was wave packet built up from elementary a·e−i·θ waves, then I’ve become a −e−i·θ wave packet now. What happened? It makes me think of the twin paradox in special relativity. We know it’s a paradox—so that’s an apparent contradiction only: we know which twin stayed on Earth and which one traveled because of the gravitational forces on the traveling twin. The one who stays on Earth does not experience any acceleration or deceleration. Is it the same here? I mean… The one who’s turning around must experience some force. This vector represents the energy flow, per unit area and per unit time, in electrodynamical situations. If E and/or B are zero (which is the case in electrostatics, for example, because we don’t have magnetic fields in electrostatics), then S is zero too, so there is no energy flow then. That makes sense, because we have no moving charges, so where would the energy go to? The heat flow vector h is the heat flux density vector, from which we get the heat flux through an area through the (h•n)·da = hn·da product. The energy flow S is the energy flux density vector, from which we get the energy flux through the (S•n)·da = Sn·da product. So that should be enough as an introduction to what I want to talk about here. Let’s first look at the energy conservation principle once again. Of course, it is not the complete energy conservation law. The local energy is not only in the field. We’ve got matter as well, and so that’s what I want to discuss here: we want to look at the energy in the field as well as the energy that’s in the matter. Indeed, field energy is conserved, and then it isn’t: if the field is doing work on matter, or matter is doing work on the field, then… Well… Energy goes from one to the other, i.e. from the field to the matter or from the matter to the field. So we need to include matter in our analysis, which we didn’t do in our last post. Feynman gives the following simple example: we’re in a dark room, and suddenly someone turns on the light switch. So now the room is full of field energy—and, yes, I just mean it’s not dark anymore. :-). So that means some matter out there must have radiated its energy out and, in the process, it must have lost the equivalent mass of that energy. So, yes, we had matter losing energy and, hence, losing mass. g is the momentum of the field per unit volume. What units would we express it in? We’ve got a bit of choice here. For example, because we’re relating everything to energy here, we may want to convert our kilogram into eV/c2 or J/c2 units, using the mass-energy equivalence relation E = mc2. Hmm… Let’s first keep the kg as a measure of inertia though. So we write: [g] = [m]·[v]/m3 = (kg·m/s)/m3. Hmm… That doesn’t show it’s energy, so let’s replace the kg with a unit that’s got newton and meter in it, cf. the F = ma law. So we write: [g] = (kg·m/s)/m3 = (kg/s)/m2 = [(N·s2/m)/s]/m2 = N·s/m3. Well… OK. The newton·second is the unit of momentum indeed, and we can re-write it including the joule (1 J = 1 N·m), so then we get [g] = (J·s/m4), so what’s that? Well… Nothing much. However, I do note it happens to be the dimension of S/c2, so that’s [S/c2] = [J/(s·m2)]·(s2/m2) = (J·s/m4). 🙂 Let’s continue the discussion. Indeed, the first term just sort of reiterates the mass-energy equivalence: the energy that’s in the matter can become field energy, so to speak, in our infinitesimal volume element itself, and vice versa. But if it doesn’t, then it should get out and, hence, become ‘momentum outflow’. Does that make sense? No? So it’s that second term on the right-hand side. What the hell does that say? Well… I could say: it’s the local energy or momentum conservation law. If the energy or momentum doesn’t stay in, it has to go out. 🙂 But that’s not very satisfactory as an answer, of course. However, please just go along with this ‘temporary’ answer for a while. On the left-hand side, we’ve got the time rate-of-change of momentum, so that obeys the F = dp/dt = d(mv)/dt law, with the force F, per unit volume, being equal to F(unit volume) = ρE+j×B. The Poynting vector S gives us the energy flow as well as the momentum density g = S/c2. But what does it all mean, really? Let’s go through Einstein’s illustration of the principle. That will help us a lot. Before we do, however, I’d like to note something. I’ve always wondered a bit about that dichotomy between energy and momentum. Energy is force times distance: 1 joule is 1 newton × 1 meter indeed (1 J = 1 N·m). Momentum is force times time, as we can express it in N·s. Planck’s constant h combines all three in the dimension of action, which is force times distance times time: h ≈ 6.6×10−34 N·m·s, indeed. I like that unity. In this regard, you should, perhaps, quickly review that post in which I explain that h is the energy per cycle, i.e. per wavelength or per period, of a photon, regardless of its wavelength. So it’s really something very fundamental. [c·g ] = (m/s)·(N·s)/m3 = N/m2 = J/m3. [S/c] = (s/m)·(N·m)/(s·m2) = N/m2 = J/m3. And, yes, it’s also about time we introduce the so-called principle of least action to explain things, because action, as a concept, combines force, distance and time indeed, so it’s a bit more promising than just energy, of just momentum. Having said that, you’ll see in the next section that it’s sometimes quite useful to have the choice between one formula or the other. But… Well… Enough talk. Let’s look at Einstein’s car. The problem is that we seem to be moving the center of gravity of this car by fooling around on the inside only. Einstein doesn’t like that. He thinks it’s impossible. And he’s right of course. The thing is: the center of gravity did not change. What happened here is that we’ve got some blob of energy, and so that blob has some equivalent mass (which we’ll denote by U/c2), and so that equivalent mass moved all the way from one side to the other, i.e. over the length of the car, which we denote by L. In fact, it’s stuff like this that inspired the whole theory of the field energy and field momentum, and how it interacts with matter. Now, what about a blob of light going from the top to the bottom of the car? Well… That involves the conservation of angular momentum: we’ll have more mass on the bottom, but on a shorter lever-arm, so angular momentum is being conserved. It’s a very good question though, and it led Einstein to combine the center-of-gravity theorem with the angular momentum conservation theorem to explain stuff like this. It’s all fascinating, and one can think of a great many paradoxes that, at first, seem to contradict the Grand Principles we used here, which means that they would contradict all that we have learned so far. However, a careful analysis of those paradox reveals that they are paradoxes indeed: propositions which sound true but are, in the end, self-contradictory. In fact, when explaining electromagnetism over his various Lectures, Feynman tasks his readers with a rather formidable paradox when discussing the laws of induction, he solves it here, ten chapters later, after describing what we described above. You can busy yourself with it but… Well… I guess you’ve got something better to do. If so, just take away the key lesson: there’s momentum in the field, and it’s also possible to build up angular momentum in a magnetic field and, if you switch it off, the angular momentum will be given back, somehow, as it’s stored energy. In my previous post, I talked about energy, and I tried to keep it simple – but also accurate. However, to be completely accurate, one must, of course, introduce relativity at some point. So how does that work? What’s ‘relativistic’ energy? Well… Let me try to convey a few ideas here. The first thing to note is that the energy conservation law still holds: special theory or not, the sum of the kinetic and potential energies in a (closed) system is always equal to some constant C. What constant? That doesn’t matter: Nature does not care about our zero point and, hence, we can add or subtract any (other) constant to the equation K.E. + P.E. = T + U = C.
That being said, in my previous post, I pointed out that the constant depends on the reference point for the potential energy term U: we will usually take infinity as the reference point (for a force that attracts) and associate it with zero potential (U = 0). We then get a function U(x) like the one below: for gravitational energy we have U(x) = –GMm/x, and for electrical charges, we have U(x) = q1q2/4πε0x. The mathematical shape is exactly the same but, in the case of the electromagnetic forces, you have to remember that likes repel, and opposites attract, so we don’t need the minus sign: the sign of the charges takes care of it. Minus sign? In case you wonder why we need that minus sign for the potential energy function, well… I explained that in my previous post and so I’ll be brief on that here: potential energy is measured by doing work against the force. That’s why. So we have an infinite sum (i.e. an integral) over some trajectory or path looking like this: U = – ∫F·ds. For kinetic energy, we don’t need any minus sign: as an object picks up speed, it’s the force itself that is doing the work as its potential energy is converted into kinetic energy, so the change in kinetic energy will equal the change in potential energy, but with opposite sign: as the object loses potential energy, it gains kinetic energy. Hence, we write ΔT = –ΔU = ∫F·ds..
That’s all kids stuff obviously. Let’s go beyond this and ask some questions. First, why can we add or subtract any constant to the potential energy but not to the kinetic energy? The answer is… Well… We actually can add or subtract a ‘constant’ to the kinetic energy as well. Now you will shake your head: Huh? Didn’t we have that T = mv2/2 formula for kinetic energy? So how and why could one add or subtract some number to that? So if we assume that the velocity of the object at point O is equal to zero (so vo = 0), then ΔT will be equal to T and we get what we were looking for: the kinetic energy at point P will be equal to T = mv2/2. Now, you may wonder why we can’t do that same derivation for a non-constant mass? The answer to that question is simple: taking the m factor out of the integral can only be done if we assume it is a constant. If not, then we should leave it inside. It’s similar to taking a derivative. If m would not be constant, then we would have to apply the product rule to calculate d(mv)/dt, so we’d write d(mv)/dt = (dm/dt)v + m(dv/dt). So we have two terms here and it’s only when m is constant that we can reduce it to d(mv)/dt = m(dv/dt). 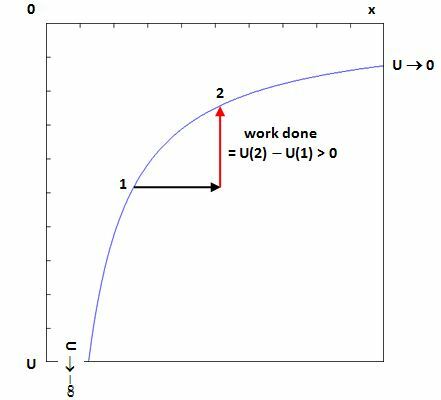 The graph below shows how γ varies as a function of v. As you can see, the mass increase only becomes significant at speeds of like 100,000 km per second indeed. Indeed, for v = 0.3c, the Lorentz factor is 1.048, so the increase is about 5% only. For v = 0.5c, it’s still limited to an increase of some 15%. But then it goes up rapidly: for v = 0.9c, the mass is more than twice the rest mass: m ≈ 2.3m0; for v = 0.99c, the mass increase is 600%: m ≈ 7m0; and so on. 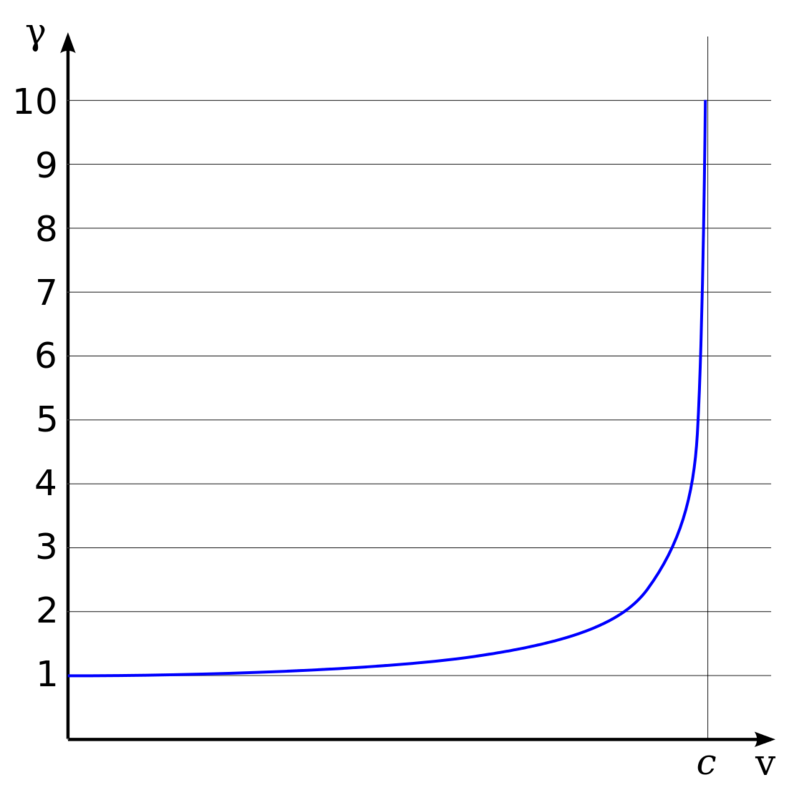 For v = 0.999c – so when the speed of the object differs from c only by 1 part in 1,000 – the mass of the object will be more than twenty-two times the rest mass (m ≈ 22.4m0). You probably know that we can actually reach such speeds and, hence, verify Einstein’s correction of Newton’s Law in particle accelerators: the electrons in an electron beam in a particle accelerator get usually pretty close to c and have a mass that’s like 2000 times their rest mass. How do we know that? Because the magnetic field needed to deflect them is like 2000 times as great as their (theoretical) rest mass. So how fast do they go? For their mass to be 2000 times m0, 1 – v2/c2 must be equal to 1/4,000,000. Hence, their velocity v differs from c only by one part in 8,000,000. You’ll have to admit that’s very close. The second is time dilation, which is also rather well known – just like the mass increase effect – because of the so-called twin paradox: time will appear to be slower in that space ship and, hence, if you send one of two twins away on a space journey, traveling at such relativistic speed, he will come back younger than his brother. The formula here is a bit more complicated, but that’s only because we’re used to measure time in seconds. If we would take a more natural unit, i.e. the time it takes light to travel a distance of 1 m, then the formula will look the same as our mass formula: t = γt0 and, hence, one ‘second’ in the space ship will be measured as 1.25 ‘seconds’ by the external observer. Hence, the moving clock will appear to run slower – to the external (inertial) observer that is. Again, the reality of this can be demonstrated. You’ll remember that we introduced the muon in previous posts: muons resemble electrons in the sense that they have the same charge, but their mass is more than 200 times the mass of an electron. As compared to other unstable particles, their average lifetime is quite long: 2.2 microseconds. Still, that would not be enough to travel more than 600 meters or so – even at the speed of light (2.2 μs × 300,000 km/s = 660 m). But so we do detect muons in detectors down here that come all the way down from the stratosphere, where they are created when cosmic rays hit the Earth’s atmosphere some 10 kilometers up. So how do they get here if they decay so fast? Well, those that actually end up in those detectors, do indeed travel very close to the speed of light and, hence, while from their own point of view they live only like two millionths of a second, they live considerably longer from our point of view. Let’s go back to our main story line: relativistic energy. We wrote above that it’s the change of energy that matters really. So let’s look at that. In case you wonder why we can replace the vectors (bold face) v and d(mv) by their magnitudes (or lengths) v and d(mv): v and mv have the same direction and, hence, the angle θ between them is zero, and so v·v =│v││v│cosθ =v2. Likewise, d(mv) and v also have the same direction and so we can just replace the dot product by the product of the magnitudes of those two vectors. So there we are: we have just shown that we get the relativistic mass formula (it’s on the right-hand side above) if we assume that Einstein’s mass-energy equivalence relation holds. Now, you may wonder why that’s significant. Well… If you’re disappointed, then, at the very least, you’ll have to admit that it’s nice to show how everything is related to everything in this theory: from E = mc2, we get m0/(1 – v2/c2)–1/2. I think that’s kinda neat! In addition, let us analyze that mass-energy relation in another way. It actually allows us to re-define kinetic energy as the excess of a particle over its rest mass energy, or – it’s the same expression really – or the difference between its total energy and its rest energy. K.E. = mc2 – m0c2 = (m – m0)c2 = γm0c2 – m0c2 = m0c2(γ – 1). Again, you’ll wonder: so what? Well… See how the non-relativistic formula for kinetic energy (K.E. = m0v2/2) appears here as the first term of this series and, hence, how the formula above shows that our ‘Newtonian’ formula is just an approximation. Of course, at low speeds, the second, third etcetera terms represent close to nothing and, hence, then our Newtonian ‘approximation is obviously pretty good of course ! OK… But… Now you’ll say: that’s fine, but how did Einstein get inspired to write E = mc2 in the first place? Well, truth be told, the relativistic mass formula was derived first (i.e. before Einstein wrote his E = mc2 equation), out of a derivation involving the momentum conservation law and the formulas we must use to convert the space-time coordinates from one reference frame to another when looking at phenomena (i.e. the so-called Lorentz transformations). And it was only afterwards that Einstein noted that, when expanding the relativistic mass formula, that the increase in mass of a body appeared to be equal to the increase in kinetic energy divided by c2 (Δm = Δ(K.E.)/c2). Now, that, in turn, inspired him to also assign an equivalent energy to the rest mass of that body: E0 = m0c2. […] At least that’s how Feynman tells the story in his 1965 Lectures… But so we’ve actually been doing it the other way around here! Hmm… You will probably find all of this rather strange, and you may also wonder what happened to our potential energy. Indeed, that concept sort of ‘disappeared’ in this story: from the story above, it’s clear that kinetic energy has an equivalent mass, but what about potential energy? That’s a very interesting question but, unfortunately, I can only give a rather rudimentary answer to that. Let’s suppose that we have two masses M and m. According to the potential energy formula above, the potential energy U between these two masses will then be equal to U = –GMm/r. Now, that energy is not interpreted as energy of either M or m, but as energy that is part of the (M, m) system, which includes the system’s gravitational field. So that energy is considered to be stored in that gravitational field. If the two masses would sit right on top of each other, then there would be no potential energy in the (M, m) system and, hence, the system as a whole would have less energy. In contrast, when we separate them further apart, then we increase the energy of the system as a whole, and so the system’s gravitational field then increases. So, yes, the potential energy does impact the (equivalent) mass of the system, but not the individual masses M and m. Does that make sense?